The SWITCH to Green technical assistance Facility provides resources to support the elaboration and implementation of activities contributing to the Flagship Initiative. Tailor-made technical assistance in the following areas responds to needs identified amongst the SWITCH regional programmes: access to finance; policy support; training and toolkits on green economy; communication actions; and private sector development. The Facility is there to help countries involved in EU development cooperation activities. It assists dialogue and cooperation between the EU and partner countries’ stakeholders promoting a green transition process. Setting up and updating of project monitoring tools. 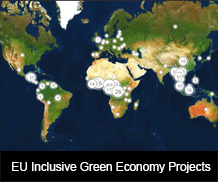 The Facility supports the organisation of policy and learning events to assist coordination and dialogue among inclusive green economy stakeholders. Likewise, the Facility creates dedicated tools contributing to knowledge-sharing. The Facility supports the planning and delivery of training and publications, with a view to promoting capitalisation of existing knowledge and EU domestic experience on inclusive green economy. Result 3: Knowledge is created, shared and communicated in an effective manner amongst the EU and developing countries.